Generally speaking, puzzle games tend to be all or nothing when it comes to pressure. On one end of the spectrum, you have things like genre grandpappy Tetris ($1.99), games that relentlessly move faster and faster in an attempt to overwhelm your ability to think fast. On the other end, you’ve got turn-based affairs that tend give you all the time in the world to tie the noose around your own neck, like most of the stages in Candy Crush Saga (Free). The challenge in the former is obvious and pretty easy to implement, but the latter type requires very careful difficulty design to avoid creating something that’s too simple and boring. 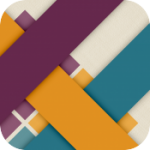 This time, we’re looking at Strata ($2.99), a very cleverly designed puzzle game of the latter variety. It has a unique gameplay hook, but as we’ve seen before, that’s no guarantee of success. 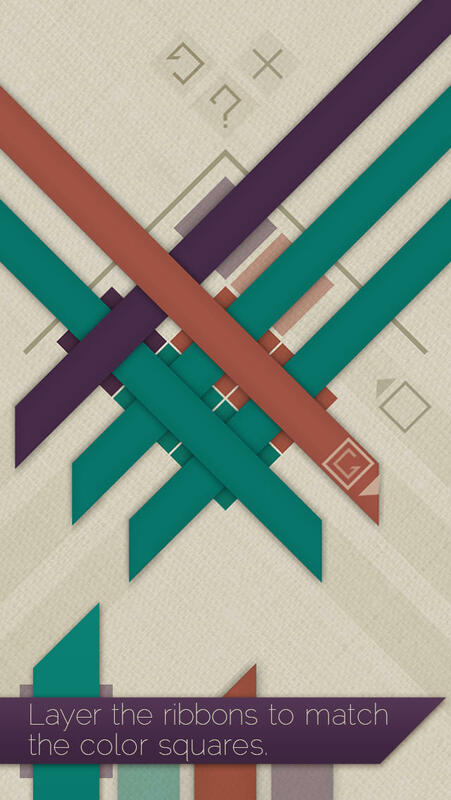 Strata is actually a pretty hard game to explain in text, but let’s give it a go, shall we? The play area is a grid that starts off as small as 2×2 but increases as you go along. The grid has various colored squares on it. The number of colors on each grid also increases as you go along, of course. The only action you can take is to choose a color of ribbon and lay it down along one of the rows or columns. Every row and column must have a ribbon across it, and the ribbons will overlap each other as you put them down. Your goal is to have the top-most layer of ribbon matching colors with the square it’s placed on. At the very least, I can say I’ve never played a puzzle game with mechanics like this before, so we’re already off to a great start. The game starts off very gently, outright giving you the solutions to the early puzzles so you can see how things are done. I’ve played a lot of games, especially recently, that have completely dropped the ball on teaching you how to play them, so it’s quite refreshing to have a game walk you through its mechanics without just smacking you upside the head with non-interactive text splashes or, worse, nothing at all. The concept behind this game took a bit of time to sink in to my brain, and I think that’s going to be the case for many people. Luckily, the game’s difficult curve is nice and smooth. It gives you quite a number of puzzles with a somewhat simple two-color, 2×2 grid design, with each puzzle being different, but requiring similar techniques to complete. For sadly all too many puzzle games with interesting setups, this is as far as it goes. However, this is just the beginning. Once it’s taught you the basics and hammered them into your head, it begins to up the ante. First, it throws another color into the mix. Now, a larger grid. Every time you start to feel comfortable and on top of things, Strata antes up. If you’re in over your head, the game very kindly allows you to undo your moves so you can work backwards to find the solution, but it does keep records of which levels you cleared without doing so. Strata is very satisfying, thanks in no small part to this excellent approach to difficulty. It never really gets dull throughout the more than 150 included levels, which is quite impressive given the amount of time you’ll spend making your way through them. The levels are broken up into three episodes, which more or less correspond to easy, medium, and hard difficulty settings. Once you’ve finished those, there are two more level packs available as IAP which effectively double the size of the game. The first pack gives you about 50 levels for one dollar, and the second pack gives you about 100 levels for two dollars. Together, they cost more than the base game itself, so they might seem like they’re not as good of a deal. However, as they’re meant as expert levels, you’ll see crazy things like 6×6 grids happening here. As a result, they take a lot longer to get through than the included stages. I felt the IAP was worth it, particularly the last “Prodigy" set of levels. One aspect of it I didn’t care for is that the levels look like they’re included until you actually try to play them. It kind of feels like it jumps out of nowhere with the sales pitch. There’s also IAP for purchasing hints, and it’s far less reasonably priced, but if you want to pay to have the game play itself for you, that option is there. I want to make special note of the aesthetics of the game, because it’s absolutely beautiful and mellow in all the right ways. It uses soft, muted colors, an intuitive and unique UI, and extremely calming sound effects to create a wonderful mood that seems to ask you to sink back in your chair and have a nice, relaxing time. It feels like a great match for the gameplay itself. Take your time, don’t panic, if you need to go back on a move, that’s fine. There’s no rush here at all. Now, don’t misunderstand, I do love those stressful, desperate, think-fast puzzle games a lot. But sometimes, it’s nice to just kick back and give the ol’ grey matter a workout without upping your stress levels, and Strata is just right for that situation. 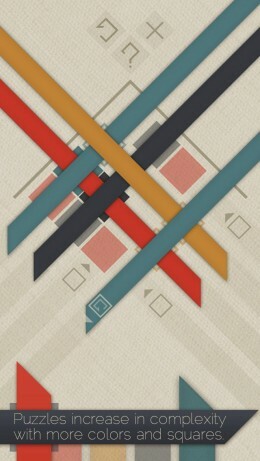 If you’re looking for a very unique puzzle game with a smooth-as-silk difficulty curve to help get your mind off the worries of the day, you might want to pick this one up. The extra episodes may seem a bit steep, but relative to the size and cost of the initial game, they’re more like built-in sequels, and there’s certainly enough included in the initial package to keep you entertained for a while.